Wat Phra Keo (the Thai name) is an exuberantly colored religious compound built inside the Royal Palace in Bangkok, Thailand. The temple's architecture is visually striking (see photo). The temple's largest and most important building is the Bot (loosely translated as "house of meditation"). 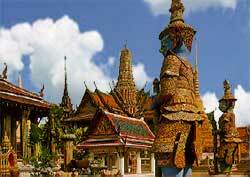 It is Thailand's most sacred shrine and the king's personal chapel, but everyone is welcome to visit it. Within the Bot resides the world-famous Emerald Buddha (actually made of green jade, not emerald). This 500-year-old holy statue is perched so high above the Bot's golden altar and is so small (only 66 centimeters or 26 inches high) that you could easily miss it if you didn't know where to look. During its 500 year history, the Emerald Buddha moved from what is now Thailand to Laos and back again. In 1782 it settled in its present temple, which has been renovated and enhanced over the last two centuries by Thai kings. They include the flamboyant giant demon statues (see photo) that "fiercely" guard the temple complex. Other must-sees include the ornate Royal Pavilion, the compact Library and the gilded Chede stupa, three highly photographed structures.